What is Drive Line? What is Propeller Shaft, Universal Joint and Slip Joint? To receive the power from the gear box output shaft and without any change in speed transmit it to the input pinion of the differential for onward transmission to the rear axle and rear wheels. To cope with the difference in line with the level of the gear box output shaft and the differential input pinion shaft. The propeller shaft has to operate at varied lengths and varied angles. The engine of the automobile is somewhat rigidly attached to the frame by springs. As the vehicle moves on the road there are jerks and bumps due to which the springs expand and contract. This changes the angle of drive between the propeller shaft and the transmission shaft. The distance between the gear box and differential also changes due to the movement of the springs. So the propeller shaft has to meet both the angular change coming between the gear box and differential and change in length of the distance between the gear box and differential. The propeller shaft is also not on the same line as the gear box output shaft but it runs to the rear axle at an angle because the level of the rear axle is lower than the gear box. So to adjust angular motion universal joints are provided and to adjust for the change in length of the propeller shaft , a slip joint is provided. The propeller shaft has to withstand the torsional stresses of the transmitting torque, and yet it must be light and well balanced so that vibrations will not occur at high speed. So it is usually made of a strong steel tube. 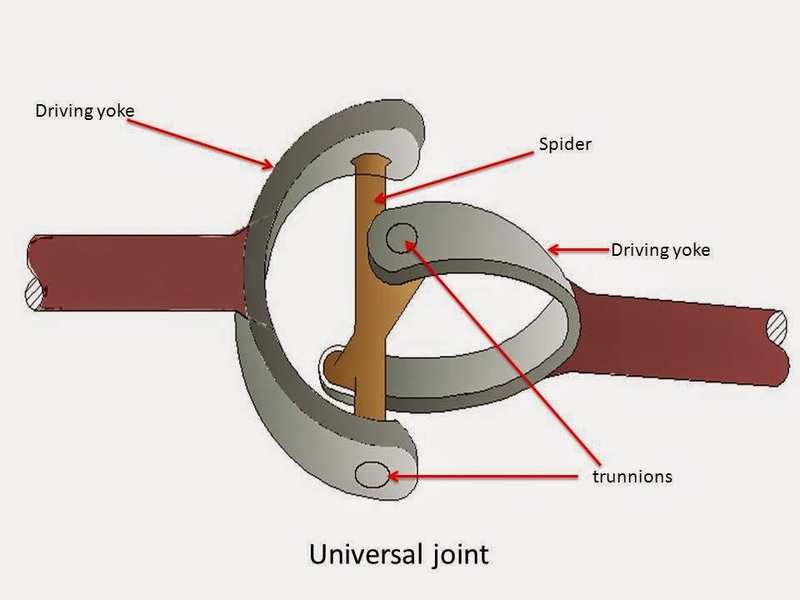 A universal joint allows driving torque to be carried through two shafts that are at an angle with each other. A simple universal joint consist two Y- shaped yoke, one on the driving shaft and other on the driven shaft. The four arms of spider are assembled in needle bearings in the two yokes. The driving shaft and yoke force the spider to rotate. The other two trunnions of the spider then cause the driven yoke to rotate. When the two shafts are at an angle with each other, the needle bearings permit the yokes to swing around on the trunnions with each revolution. A simple universal joint does not transmit the motion uniformly when the shafts are operating an angle. Because of this, two universal joints are used in a vehicle, one between the gear box and the propeller shaft and other between the propeller shaft and the differential pinion shaft. 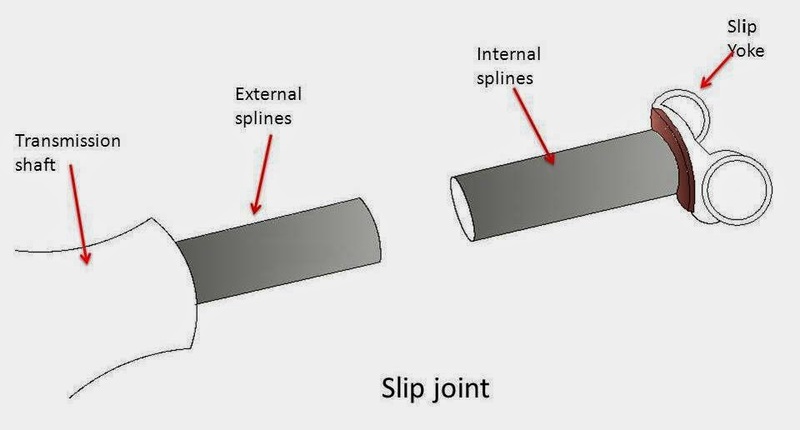 Slip joint is attached to the driven yoke in order the increase or decrease the length of propeller shaft. It has outside splines on the shaft and matching internal splines in a mating hollow shaft or yoke. When assembled the splines cause the shafts to rotate together while they can move back and forth. This changes the length of propeller shaft. Today we have learnt about propeller shaft, slip joint and universal joint. If you have any query regarding this article, don’t forget to share it on social networks. Subscribe our website for more informative articles. Thanks for reading it. What is Engine Knocking? How to Fix it? ← What is Gear Box? What are Main Components of Gear Box? very much helpful and descriptive information.